3.5 hours of video with Pema Chodron interspersed with discussion, writing up notes, breaks and lunch. Pema Chödrön reveals the time-tested Buddhist antidote to suffering – and shows how to apply it in your own life. The simple and elegant meditation practice known as tonglen, she teaches, is the perfect medicine for “ordinary people like ourselves.” Through tonglen, we can use life’s difficulties as a way to befriend ourselves, accept the past we have rejected, and widen our circle of compassion. Within the wisdom teachings of Buddhism, there are many stories that refer to its founder as the “Supreme Physician” – a healer of all illness – mental, physical, and spiritual. 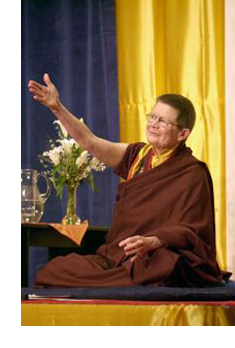 On these Good Medicine videos, the remarkable American-born Tibetan nun known as Pema Chodron shares the gift of tonglen, Buddhism’s original prescription for using the difficulties in life as a way to widen our circle of compassion. To register your interest, contact Pamela.